Home Acceptance What’s the Point of Freaking Out? What’s the Point of Freaking Out? My car was totaled this week, my dog had cancer surgery (giving him an enormous 10-inch incision), and I am flat broke. It sounds like the opening lines to a bad country song. I admit I was a little freaked out when my daughter called, but I felt better when I saw that she and my son were OK. The car isn’t drivable, and I’m currently waiting on the other driver’s insurance to let me know what they’re going to do. I have no car as we wait for a police report before they will confirm their driver’s responsibility. Oh, and did I mention my dog? Yeah, Max got an appointment 2 weeks ago to have the aggressive soft-tissue sarcoma taken off his side and back this week. I no longer had a car to get him to the vet on Wednesday, so I had to scramble for rides. I couldn’t put off the surgery because the tumors had doubled in size in only two weeks. 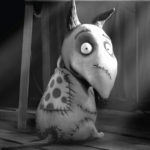 I was blessed with offers to take him to/from the veterinarian; though, Max looks a bit like Frankenweenie right now with all of his stitches, so that’s a little freaky. The icing on the cake for the week was the paycheck from my part-time job didn’t match up with my budget, so now I’ll be cleaning out my cabinets and fridge for the next few weeks, eating some preserved goods thrown in with the bit of fresh stuff I can afford. So my property (car), health (dog and my diet), and money (dumb mistake) have been thrown into chaos just a bit. Why am I not completely freaking out?! It’s because of a couple of things. I am grateful as heck to be getting by. I’m not eating the perfect, fresh-produce diet I’ve been shooting for, but I’m eating, unlike so many other people on this planet who go without. My current bills are paid, nothing is outstanding and I have enough to cover my basic bills until I can get another paycheck. My dog is alive and recuperating. And my kids are not in the hospital or dead. I know that my “problems” aren’t really problems in the grand scheme of things. 5 of Pentacles/Coins (Taurus). DESTABILIZED. Fives bring upheaval and destabilize their suit. 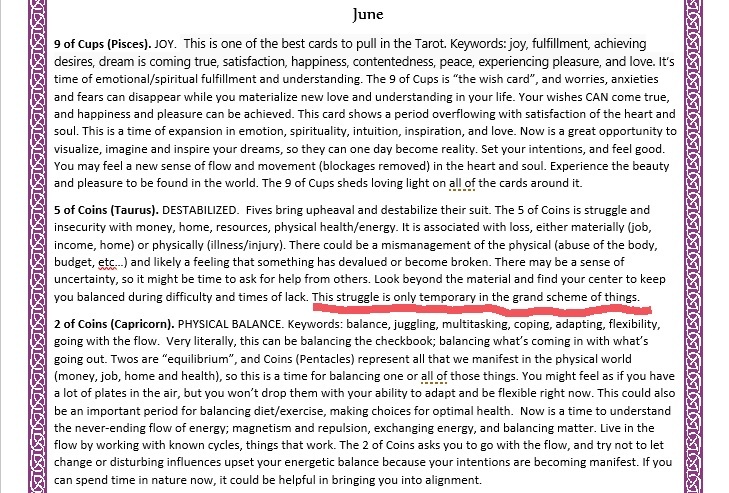 The 5 of Coins is struggle and insecurity with money, home, resources, physical health/energy. It is associated with loss, either materially (job, income, home) or physically (illness/injury). There could be a mismanagement of the physical (abuse of the body, budget, etc…) and likely a feeling that something has devalued or become broken. There may be a sense of uncertainty, so it might be time to ask for help from others. Look beyond the material and find your center to keep you balanced during difficulty and times of lack. This struggle is only temporary in the grand scheme of things. So while my world may seem to be “falling apart”, I know that isn’t the case. I believe that chaos (and 5’s) come when it’s time for a change, and it looks like I have a lot of that coming. Note: I didn’t mean for this post to be a shameless plug for my annual readings, but I guess it kind of turned out that way. That wasn’t the initial intent; however, if you’re interested in an annual reading, that’s cool and you can check it out here. Annual reading, annual tarot card reading, attitude of gratitude, gratitude, looking ahead. Bookmark.